A test of random event generators featuring Doepfer's A-149-1 Source of Uncertainty, Analogue Solutions' SH-NZ and Colin Fraser's Sequentix P3 sequencer. The S&H/ Noise variant is the classic random generator and I've had much mileage out of my SH-NZ. However, sometimes I need something more controlled, for example when randomising the decay of an envelope or addressing one of the A-152 Multiplexer's eight outputs. Another situation might be when I want positive-only or scaled voltages. 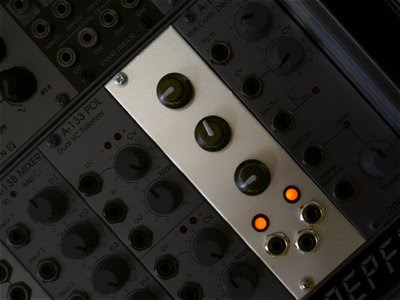 Enter the Buchla-inspired A-149-1 Source of Uncertainty. It offers attenuatable, quantised random values and is a great alternative when you need more control over your 'un-control', so to speak. The additional digital random outs further enhance its flexibility. 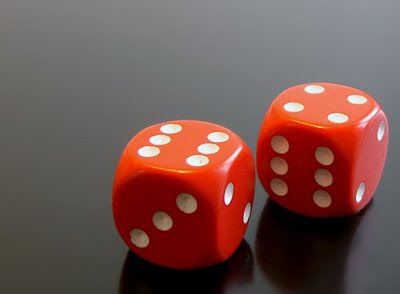 However, being based on a digital algorithm, it's not quite as random as you might think. The P3 is the deluxe option in this test. It offers a wealth of aleatoric possibilities or, if needed, precise control. Of course, it's no longer in production and will set you back considerably more than the A-Sol & Doepfer modules and some modular purists might call it cheating. You can download the test (10.5MB) here. First public outing for my second DIY module: the Trigger Twin dual comparator. Inspired by Peter Grenader's Triple Event Timer, I gave up on my original LM339 design and settled on a simple Op-Amp circuit. A timing CV is fed into the lower middle jack, pots one and two are used to adjust the delay time, triggers are output from the left and right jacks, orange LEDs indicate the on and off time. I designed this module as a companion to Doepfer's A-147 VCLFO, using the pulse output as the initial trigger and the triangle output as the timing CV. In order to fine-tune the device, I added an offset voltage which, using the Plan B vernacular, serves as a Time Base control. Counterclockwise is 'tight', clockwise is 'sloppy'. For those of you wanting to try this at home, just consult the TL072 etc datasheet for example comparator circuits. The timing CV and offset are mixed via resistors and fed to both comparators in series (no fancy limiting or switching involved!). I brought the outputs down from 12V to ca. 3.5V with a couple of resistors and followed this with a diode to block any negative voltage. I opted to make my reference voltage zero to +12V but, of course, you might want to make it bipolar. The parts and components were bought from Rapid in the UK, Banzai and Schneidersbuero, both here in Berlin. Background to this project including audio is here, here, here and here. Take a generous handful of comparators, a pair of voltage controllable LFOs, a random source, a wave-folder and an equal measure of VCOs, EGs & VCAs. Toss them into a marinade of tape delay and poly chorus and this is what you might get. 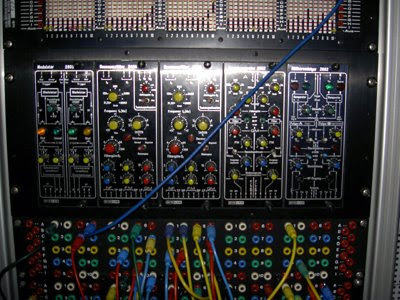 All elements were triggered from a single clock source with subsequent rhythms derived from a home-brew dual comparator, Doepfer A-143-1 and Plan B Model 10. 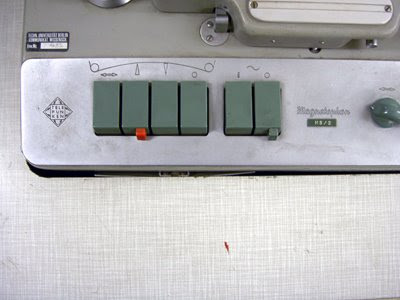 A sequential switch was used to inject random timing and pitch modulation. A Tour of the Technical University of Berlin's Electronic Music Studio Storeroom. 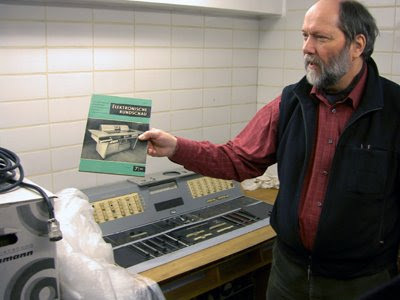 After 35 years as the head of the Berlin Technical University's Electronic Studio, Folkmar Hein went into retirement this February. He's composed more than 100 pieces of electro-acoustic music, was a co-founder of the 'Interventionen' festival and DegeM association and has been a promoter of electronic and new music events around the world. Since 1985 Folkmar Hein has curated an electro-acoustic music listening session on Thursday nights at the TU - a forum for composers, artists, students and those interested in EA music to perform, hear and discuss. Last Thursday was the last session under his stewardship and those who attended were treated to beer, pretzels and a rare glimpse into the studio's storeroom. 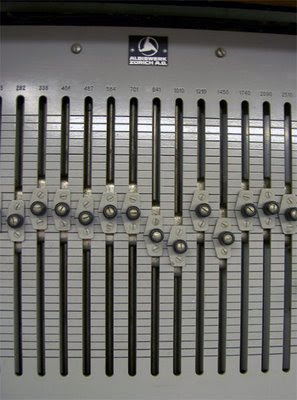 Folkmar Hein at the Hochschul-Universal-Mischpult für Experimentierzwecke, an experimental mixing desk built at the TU in 1959. Close-up of a Telefunken M5 tape recorder. These machines played an integral role in composition right up to the 1980s. 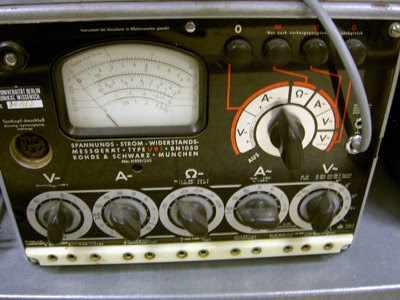 As Folkmar Hein commented: "Zeit gab es nicht, sondern Meter" (Back then, there was no time, only meters). Albiswerk graphic EQ. A studio standard offering 60dB of cut or boost. 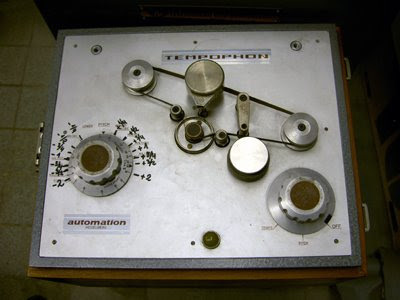 The Tempophon or 'Springermaschine", late 50s. 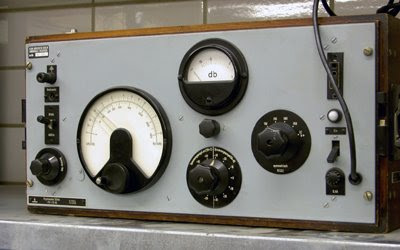 Used in conjunction with a modified M5, this device was a forerunner of the time stretching and pitch transposition functions found in modern samplers. 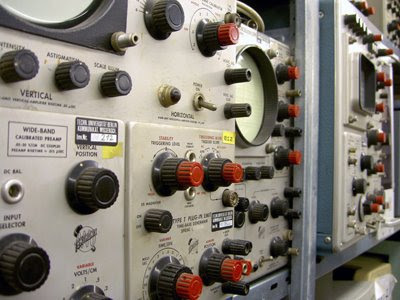 Out of sight, to the right of this machine, was another M5 which was modified to run at 1.5 cm/ s. Originally designed for use as an earthquake monitor, it could also be used to record DC signals. The Event Recorder. The Studio's first sampler, fully expanded with six 2k cards giving a total of 12k memory, it offered a third of a second sampling time. 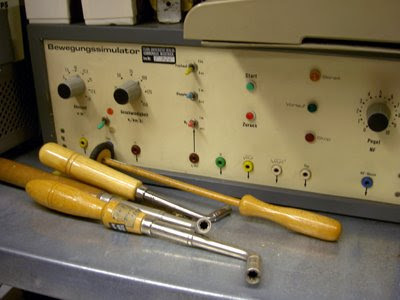 The Bewegungssimulator. Used for Doppler effects. 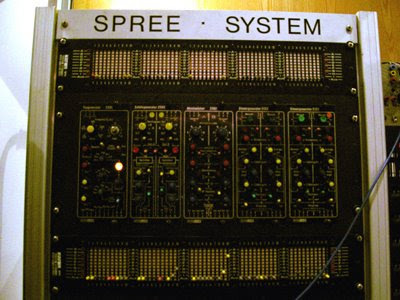 The SynLab Spree System modular synthesizer, located in the main studio. More information on the SynLab here. The storeroom tour was a fascinating trip through the history of music technology. 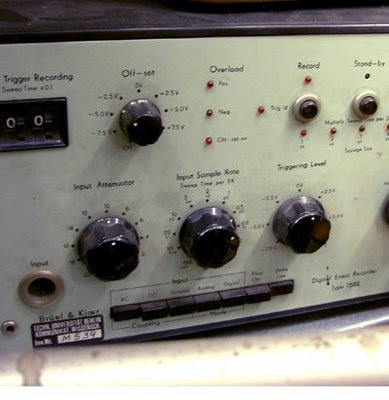 It wasn't all as old as I thought: amongst the Bakelite and VU meters were several pieces of more recent techno junk: Atari 1040STs, Commodore floppy drives, early ProTools rigs and unused Lexicons all lay gathering dust, testimony to the studio's 56 year history. You can read more about the TU studio here or in the book "Musik..., verwandelt" (Wolke Verlag, 1996). The EA music archive is here. Myspace is here. Thank you Folkmar and all the best!